As a recruiter, it is important to understand how to get a hold of potential recruits you are interested in before someone else does. Engaging an athlete through frequent conversations is the best way to build a relationship with them. Having a contact plan is something every coach should have prepared before they start reaching out. To our surprise, there was an even split between twitter direct messages (DM), text, and phones calls. The results were the same in all regions across the country. 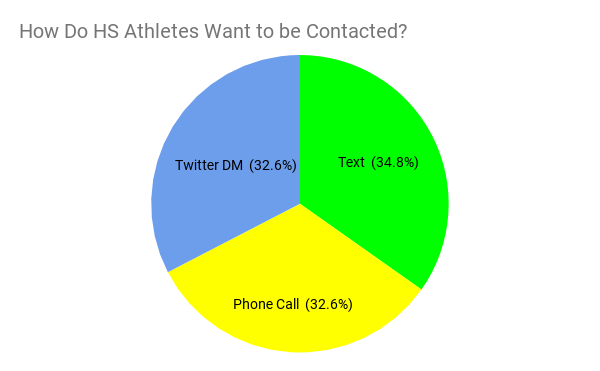 These results demonstrate that coaches should be using all three of these methods while contacting recruits until they learn which approach is the most effective with each athlete. Why do HS Athletes Play Football?